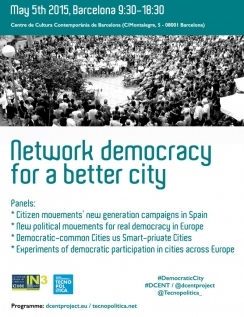 “Network democracy for a better city”, an event organized at the CCCB of Barcelona for the D-CENT project (Technologies for Decentralized Citizen Participation, which has just published a report we recommend on the management of the commons in the knowledge economy) focused on the creation of free and decentralized tools for network democracy. As such, it has centered the debate on the close relationship between democratic practices and digital technologies. Although digital tools have played an uncontestable role in the political transformations that have taken place since 2011, it’s important to recognize that the issue of democracy will not be solved from a purely technical standpoint. In other words, the inherent failings of representative democracy cannot be approached through the usage of technological platforms and networks. From a critical look at cognitive capitalism and the neoliberal model of the smart city full of technological utopianism, the activists, hackers, researchers, digital entrepreneurs and politicians that participated in the conference discussed ideas and specific proposals. Specifically, they addressed the issue of innovation in the forms of participation in political and public life within the framework of the so-called smart city (or "smartass city”, according to Xabier Barandiaran, a leading figure in of Ecuador’s Flok Society project). Throughout the day, they "cooked up" a series of recipes whose main ingredient was participation, marinated with various technological ingredients including platforms, free software and applications created by and for citizens from new political formations such as Barcelona en Comú, Podemos, Ahora Madrid, social enterprises, organizations, etc. Bringing all these resources together in service of the Spanish and European citizenship represents an opportunity to exchange experiences and sound out their scalability and adaptability. We reviewed the "menu" of the day, following the culinary analogy through the theme of the meeting, highlighting the main proposals which, in the “open” and the commons aspects, open new opportunities for the emancipation of citizens. If the smart city is a neoliberal product that draws upon the data put out by citizens and captured by big corporations which use them to reproduce the capitalist system and expand its market gap, Gemma Galdón (researcher at the UOC and consultant Eticas Consulting) and Francesca Bria (coordinator of D-CENT and Nesta Innovation Lab projects) stress the importance of the reappropriation of data by and for the citizens. In their opinion, the use of free software / open hardware is essential for the creation of open ecosystems and social entrepreneurship experiments (as in the case of the Fab Lab or makerspaces). For our first course, we have several participative tools to drive collaborative policies at the national level. Kuorum.org, as presented by its co-founder Matias Nso, is a social enterprise founded in 2013 whose mission is to improve communication between citizens and their political representatives through technology, and whose profits are reinvested in training for people at risk of digital exclusion. The Kuorum financing model is based on charging the costs to the same politicians for their access to data on views expressed by citizens and organizations around their policy proposals. On the other hand, the Bank of Talents is a crowdsourcing tool by Miguel Ardanuy, head of participation for Podemos, designed to involve the different professional figures and experiences of individuals in their political projects as needed. Miguel Aguilera, member of Podemos Aragón and Zaragoza en Común, proposes a series of open source digital tools to collect proposals coming from the public which, though a filtering system based on the percentage of the voting population, reach the citizens council. 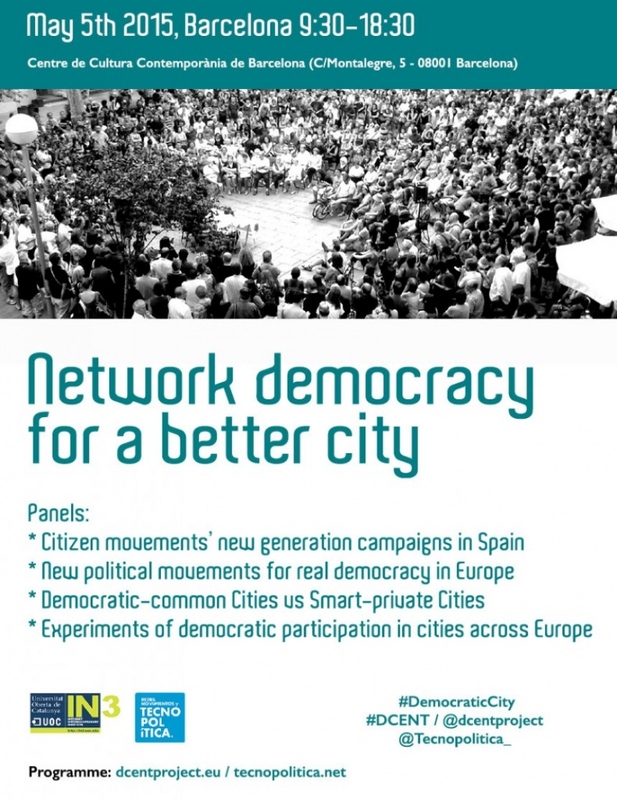 On the other hand, the challenge presented by combining digital and offline participation has led Bcn en Comú, represented at the conference by Javier Toret and Gala Pin, to stipulate an ethical code, an online discussion tool for collectively drafting a new contract between citizens and their representatives. All of these “recipes” help propel effective policy initiatives, which were discussed in the last panel dedicated to new political movements, which are either represented within their governments or actually lead them. In Greece, Syriza’s Andreas Karitzis is an example of the former; in Iceland, Birgitta Jónsdóttir of the Pirate Party is a member of parliament. For main courses, we have experimented with the fusion of experiences of digital participation at the European and international levels, thanks to the presence of Marcelo Branco, Brazil. Branco presented the "Civil Internet Framework" (or Brazil Internet Bill of Rights), created collaboratively in order to defend freedom of expression and other civil liberties endangered in the network by the 2008 anti-cybercrime law. The conceptual framework of the European experience was reflected by Fabrizio Sestini, scientific commissioner in the European Commission responsible for the CAPS initiatives (Collective Awareness Platforms for Sustainability and Social Innovation), aimed at developing bottom-up solutions for better awareness, decision-making and cooperation among citizens, based on innovative technological solutions. Among other proposals, we have Open Ministry presented by Joonas Pekkanen, software entrepreneur from the Forum Virium Helsinki. Open Ministry is a crowdsourcing tool for communicating citizen- and NGO-led legislative proposals to Parliament. We also heard a proposal from Robert Bjarnason, founder of the Citizens Foundation, called “Your Priorities", open source and easily implemented by all citizens who want to contribute their proposals. Among other main courses, we find not only recipes prepared by citizens, but also open government proposals made by governments. Estonia is one example, with the Praxis platform presented by Hille Hinsberg, whose mission is to provide strategic advice to policy makers and encourage public discussion and participation in decision-making processes. All the tools presented during the conference have begun to sketch out multi-faceted and joint solutions to the shortcomings of the current democracy. The intention is to project digital experiments in the co-management of public spaces. However, many of these will require a systemic sustenance that respects the open and collaborative values espoused by many voices. Extending the menu metaphor, Goteo would like to offer the refreshments by providing a social network of collective financing (monetary contributions) and distributed collaboration (services, infrastructure, microtasks and other resources) to replenish these resources and common tools. We’ve already had the pleasure of doing so in campaigns for open data and transparency projects, or more recently, projects around citizen monitoring, speculative building development and the relationships between politicians and economic lobbies.